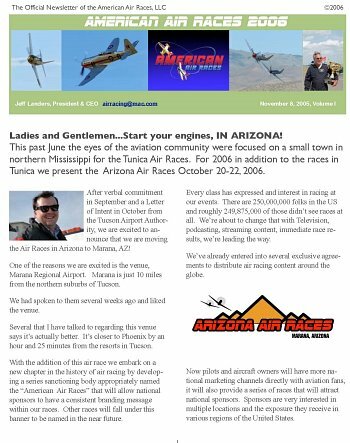 Last month we reported that Jeff Landers had another race for next year, it was to be held at Ryan Airfield in Tucson, Arizona. From what we've been told by Landers, this report might well have carried some very bad news. The event in Tucson, very nearly fell completely off the radar screen! Management at Ryan Airfield backed out of their commitment for the event after much planning by Landers' American Air Races group, their actions this late in the game, very nearly sunk the project completely. Good news! The event will go on, however, the date has been changed from early March, to late in October, 2006, and the event will now be held in what looks to our eye as a much better location.